The science of prosthetics is a dark art. Driven in its development by an unholy combination of sci-fi-like human imagination and the horrors of war, it has long held a shuddery kind of fascination for onlookers. The First World War left 240,000 British soldiers suffering total or partial leg or arm amputations, whether blown off or cut off because of injury or infection. As is too often the case, it took a tragedy to give birth to a revolution. These horrific injuries led to the first great leaps in prosthetics development. And conflict has driven the sector ever since. Better armour and field surgery in Iraq and Afghanistan meant fewer deaths – limbless soldiers who would previously have died from their injuries were flown home. 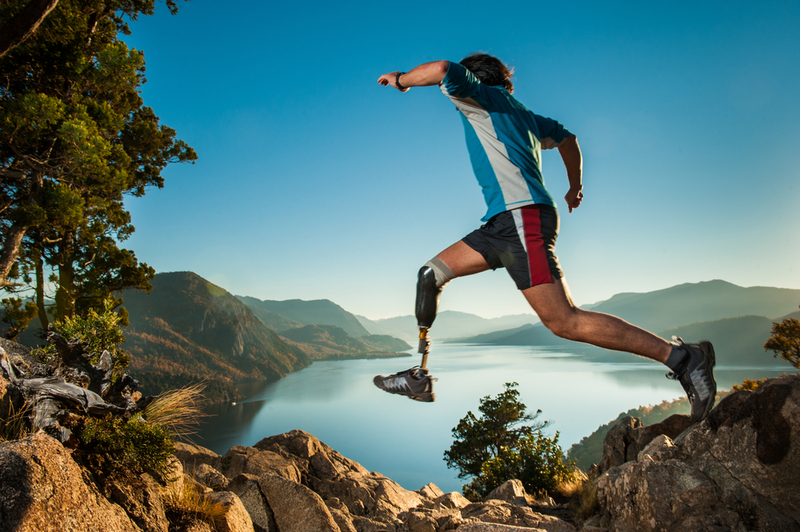 The U.S. government has spent $144 million since 2006 on prosthetics research and more than 300 military amputees have returned to active duty. With combat amputees often suffering complicated injuries, the rehabilitation process starts with experienced occupational therapists working closely with patients, using electronic sensors over the muscles that remain. These sensors capture electromyographic (EMG) signals that trigger audio and video feedback. Therapists have developed a way of using these signals to operate video games – it’s not only rewarding and fun, but leads to skills being mastered more quickly. As the patient hones the skills, his other wounds are healing and, when both elements are ready, body-powered prostheses can be fitted. In the UK, the government has set aside £6.5 million to ensure wounded service personnel are given the most up-to-date prosthetic limbs, complete with in-built microprocessor technology. These intelligent microprocessors anticipate the wearer’s actions and adjust as if the nerves were in charge, for example moving a hydraulic knee, which allows a wide range of natural movement. Fresh innovations in upper limbs include hands that can maintain constant grip force through built-in sensors in the fingertips. The sensors provide feedback to a microprocessor which automatically tightens the grip to prevent objects from slipping out of the hand. Myoelectric hands can grip and gesture naturally, moving in two dozen ways in response to tiny muscular movements in the residual limb – and researchers at the Cleveland Veterans Affairs Medical Center and Case Western Reserve University have now developed a system which conveys a sense of touch from 20 spots on a prosthetic hand. Thought-controlled artificial limbs may seem like sci-fi bunkum but they already exist, thanks to a process known as brain-machine interface, or BMI. In 2011, stroke victim and quadriplegic Cathy Hutchinson commanded a robotic arm to pick up a container of coffee and bring it to her lips just by thinking about it – the first time in 15 years that she was able to drink without assistance.Currently, patients using the technology have to be hooked up to external computers, but scientists are working on a way of completing the whole process inside the human body. Looking further ahead, just as pacemakers and hearing implants are widespread today, mechanical organs will be able to replace – and even improve – normal body functions. And that’s where Miah’s comments in The Week come from. ‘These technologies don’t just repair us, they make us better than well,’ he comments. Indeed, the experts say we’re not far from a future portrayed in films such as Star Wars, RoboCop, and The Matrix, where man and machine become one. Much of it’s already possible – and a lot more is just around the corner. The US military, for example, hasn’t quite built Iron Man, but they are testing the Tactical Assault Light Operator Suit (TALOS), which will enrobes soldiers in a powered exoskeleton with bulletproof body armour, a built-in weapon, and computer-generated displays. Occupational therapists will play a key role in a future where humans are stronger, faster and healthier. To be part of the rapidly-evolving sector, check out the latest jobs.